Cedar Instrument Maker: Drums, Rattles, Flutes, Digeridoo and eclectic one-of-a-kind creations. Huckleberry has played guitar devotedly for over 50 years, composing songs all along. He has performed his original music in the US (mostly West Coast), Canada, England, Ireland, Chile, Peru, Costa Rica, Australia, South Africa, New Zealand and Hawaii. Huckleberry claims the Forest as his greatest musical inspiration. He did have a few human influences as well…. Working as a traditional shipwright, he began singing sea shanties. For 13 years he performed with Donkey’s Breakfast at the Pacific NW Folk Life Festival and other Maritime Events with a sea shanty group, a family folk group and solo. Huckleberry plays traditional Irish music and has performed to cheerful St Patrick’s Day crowds at Irish Pubs around the globe. The good news is he’s been busy composing…and the best is yet to come! Huckleberry’s recent compositions come pure from the heart of the ancient forest. Be careful though. 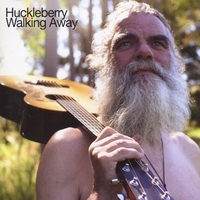 Listening to Huckleberry’s music will make you want to take your shoes off, turn your back on the city and head for the forest…. to free your sole. Huckleberry has made 2 CD’s. You can check out Walking Away right now! Melody of Freedom will be re -released soon! Campfire Sessions with Mick and Huckleberry are coming soon as well as more CDs with original songs from Huckleberry. Sign up here for the email list to keep up to date on new releases, concerts and other ways you can participate. Send Huckleberry a reply here.